What a mess of a home finale. An inexcusable loss, really. 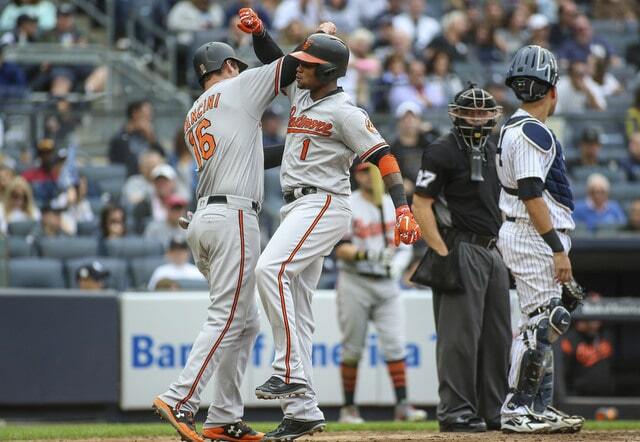 The Orioles had to get 27 outs from their bullpen and they still managed to hold the Yankees to four hits, including just two after the first inning. When the 2018 Yankees fall flat, they really fall flat. They lost Sunday’s series finale 6-3 and, as of this writing, they’re one game up on the Athletics in the loss column for homefield advantage in the Wild Card Game. Two, really, because the Yankees hold the tiebreaker. Oh, and by the way, Didi Gregorius is hurt. Potentially for the rest of the season. Baseball is bad, actually. Couldn’t have asked for a better start Sunday afternoon. J.A. 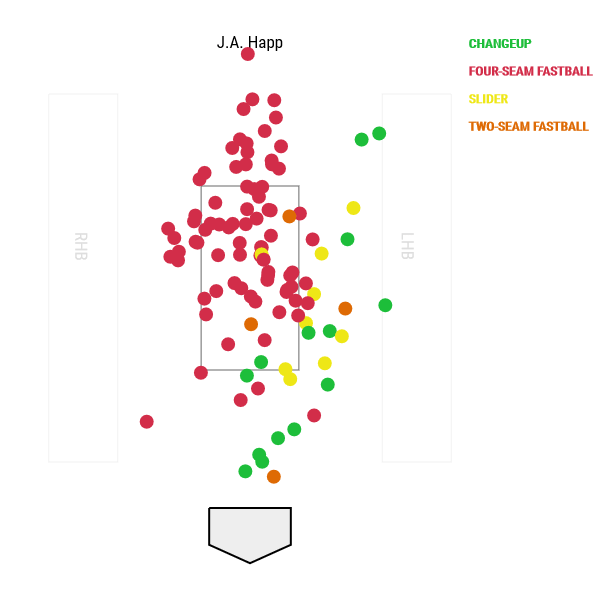 Happ struck out the side on 16 pitches in the top of the first inning, then Alex Cobb had to exit the bottom half with a blister after only four pitches. That stinks for him — Cobb had been nursing a blister the last few days and it acted up again — but it was great news for the Yankees (in theory). Nine innings against the O’s bullpen? Sign me up. 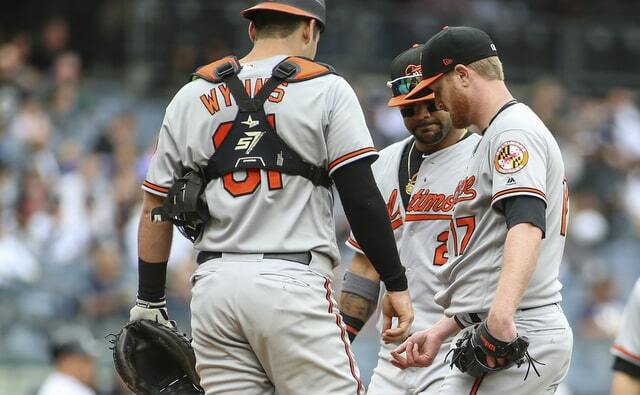 Reliever Mike Wright Jr. inherited a 2-2 count from Cobb, walked Andrew McCutchen, walked Giancarlo Stanton, and walked Luke Voit to load the bases with no outs. Bases loaded with no outs seems to be the Yankee’ kryptonite this year. Rather than waste a(nother) prime opportunity, the Yankees pushed across three runs. Gleyber Torres hit a sacrifice fly to right field, Miguel Andujar lined a single to center, and Gary Sanchez blooped a single to shallow right. The hardest hit ball of the inning? Adeiny Hechavarria’s inning-ending line out to right field (99.5 mph). Go figure. I thought it had a chance to slice away from John Andreoli and get down for another run-scoring hit, but no luck. Andreoli made a nice sliding catch. I’m not sure Adam Jones gets to that ball based on what I’ve seen from him in right field the last two weeks. Oh well. A three-zip lead after one inning works for me. The rest of the game did not work for me. After tagging Wright for three runs on two hits and three walks in the first inning, the Yankees had three baserunners the rest of the game. 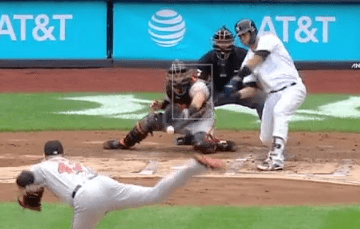 Andujar doubled with two outs in the third, Aaron Hicks drew a pinch-hit walk with one out in the seventh, and Giancarlo Stanton ripped a leadoff single in the eighth. That’s it. Two hits and one walk in eight innings against the Orioles bullpen? How awful. What a sad showing by the offense. This game should’ve been over before the bullpen ever had a chance to screw it up. Good gravy what a grind for J.A. Happ. Happ needed 107 pitches to get through five innings against the Orioles. The 2018 Orioles. He allowed five hits and four went for extra bases (three doubles, one home run), yet he held the O’s to one run on Tim Beckham’s long solo homer in the second inning. Happ’s final line: 5 IP, 5 H, 1 R, 1 ER, 2 BB, 7 K, 1 HR on 107 pitches. It was a grind all afternoon. His pitches by inning: 16, 24, 28, 17, 22. Yeesh. That’s how you end up with 25 total foul balls, including 12 in two-strike counts. Much like Lance Lynn on Saturday, Happ probably doesn’t get through five innings against a better team. He had to battle for every out against a bad Orioles lineup Sunday. This was almost certainly just a blip and one of those days. They happen. I sure hope we see a much better performance next time out though, in what could be a tune-up start for the Wild Card Game. Aaron Boone’s obsession with A.J. Cole has gone too far. That was the case like three weeks ago. But on Sunday, with most of the top relievers down due to their recent workloads, Boone again went to Cole in a close game, and again Cole let things get out of hand He entered with the Yankees up two runs the sixth inning. Three batters later, they were down one run. Double, homer, homer. Cole has allowed 21 runs and 35 baserunners (and eight homers) in his last 14 appearances and 15 innings. Dude has to go. Brian Cashman has to take him away from Boone. Dellin Betances: Pitched each of the last three days. Zach Britton: Pitched the last two days and three of the last five days. Aroldis Chapman: Pitched two of the last three days and just came back from the 10-day DL. Chad Green: Pitched two of the last three days and three of the last five days. Jonathan Holder: Pitched three of the last four days. David Robertson: Pitched two of the last three days. Robertson was the only one of those guys who didn’t pitch Saturday and, presumably, he was being saved for the later innings. It’s silly, I know, but that’s what managers do. They save their best relievers for the later innings. Happ bowed out after five innings and someone was going to have to get outs in the sixth and seventh (and eighth?) innings. Boone went to Cole and it backfired spectacularly. Why not Sonny Gray or Luis Cessa or even Justus Sheffield? How many more times do we need to see Cole get bombed to know he shouldn’t pitch in close games? Once Cole did his thing, Tommy Kahnle came in and made it worse. He allowed an insurance run on a double, a ground ball to move the runner up, and a sacrifice fly. Cessa pitched the final three innings and did allow an eighth inning insurance run on an infield single and a double, which makes him the Yankees’ most effective reliever of the day. The drop-off from the regular late-inning guys to everyone else is pretty drastic. Fortunately Cole and Kahnle won’t be on the postseason roster. To bad that doesn’t help the Yankees now. Andujar’s third inning double was his 43rd of the season, so he is one away from tying Joe DiMaggio’s franchise rookie doubles record. The AL rookie record is 47 by Fred Lynn. That is well within reach with seven games to play. Also, Andujar has 70 extra-base hits overall this season. That is the third most by a rookie in franchise history. DiMaggio had 88 in 1936 and Aaron Judge had 79 last season. Two hits for Andujar (single, double) and one apiece for Sanchez and Stanton (singles). McCutchen, Stanton, Voit, and Hicks drew the walks. Again, the Yankees had five baserunners in the span of seven batters in the first inning and then three baserunners in the final eight innings against the worst team in the last 15 years. That is really pathetic. The final week of the 2018 regular season. The Yankees have four games in Tampa and three games in Boston. The starting pitchers for Monday night’s series opener at Tropicana Field are listed as TBD. In fact, the starting pitchers for the entire series are listed as TBD, for both teams. The Rays will probably use an opener Monday. (Actual starting pitchers Tyler Glasnow and Blake Snell pitched the last two days, so it won’t be them.) Luis Severino is lined up to start Monday, though the Yankees could shift things around to get everyone situated for the Wild Card Game. We’ll see.